The Canada (Canadian) goose is a handsome waterfowl distinguished by a black head and neck, with a white “strap” extending from both sides of the head and meeting under the throat. Its overall body feathers are varying shades of brown and gray. There are several physical differences between the seven groups but, for the most part, it’s easy to recognize all of them as Canada geese. 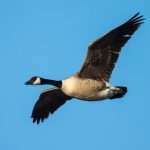 The black head and neck and white band across the chin belong almost exclusively to the Canada goose. The two exceptions are the cackling goose and the barnacle goose, which share a slightly varied pattern of those three particular markings. 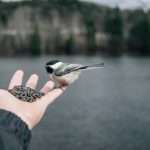 Chickadees are bouncy, energetic little birds that dart rather nervously from branch-to-branch. This somewhat erratic-looking behavior is perfectly normal for a tiny bird that is viewed as a delicacy for a number of predators, including hawks and owls. The Black-capped chickadee is the most common and the most plentiful of the seven species. They are non-migratory and spend the entire year from New England to points on the West Coast. Their western range takes them all the way to New Mexico and, in the eastern portion of the country, they’re seen from the Appalachian Mountains south to Georgia. There are dozens of adjectives to describe the American goldfinch and his British counterpart. Lively. Cheerful. Perky. Energetic. Animated. Athletic. Bouncy. Take your pick or add more. The goldfinch is wonderful to watch, either in the wild or as a back yard resident. The goldfinch was originally described in 1758 as a small bird from four to six inches long with a 7.5 to 8.7 inch wingspan. The beak is small, cone-shaped and a pinkish color. The design of the beak makes it perfect for extracting seeds from flower heads, such as sunflowers. 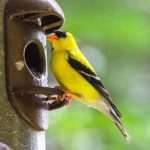 The American goldfinches are songbirds that go through two molts per year, which is very unusual. The pink beak mentioned above turns bright orange during the molting. Who doesn’t love birds congregating in their yard? 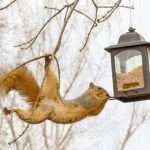 Hummingbirds are quite majestic to behold. These quick, agile birds are a member of the Trochilidae family and are the smallest bird species known to man. On average, they measure only three to five inches, and weigh about two-and-a-half grams. Hummingbirds are marked by their colorful appearance, with varieties appearing in bright blues, greens, and the like. Most notable, though, is the Hummingbird’s great speed. They fan fly at more than thirty-four miles an hour and flap their wings more than fifty times a second. As such, they have a high metabolism, the greatest of any homeothermic animal. 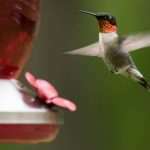 They’re beautiful birds, and to give them a boost (plus attract them to your yard), you’ll need a quality hummingbird feeder to supply them with nutrients when they decide to hang around your property.